It’s not even related to a tomato, and is actually a tree fruit. For years the coyotes beat us to the punch and ate every one. We pruned the trees last year, so the trees couldn’t be easily climbed by Wiley anymore, and so this year is the first ever that we have a good crop. Hopefully Mr. Coyote won’t turn to my avocado trees instead…. Anyway, you can eat these persimmons when they are still somewhat hard (although as they soften, they are sweeter). 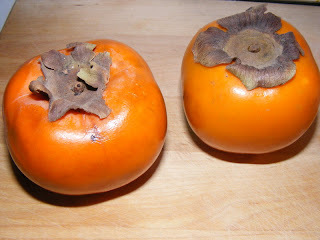 Don’t confuse this Fuyu persimmon, which can be eaten hard, with a Hichiya, which is longer and pointier. You eat one of those before the dead ripe stage and you with never, ever, make that mistake again. The unripe fruit’s taste is bad, and I think, just to make myself clear, the word taste, is an understatement, you are more likely to look back on it someday, after getting over it, as a culinary train wreck, The ones in your baskets this week are good to eat at any stage. They can be peeled and sliced into a fruit salad, thrown in the blender for a smoothy, chopped into cubes and used in a cookie batter as you might raisons, or baked into a pie as you would apples. In fact an Asian pear- Fuyu persimmon pie, recipe below is worth trying. Preheat oven to 375F. Combine frut, juice, salt and giner in an 8-inch square baking pan. In a separate bowl comtine topping ingredients. Sprinkle topping over fruit and bake for 40 minutes.